Music From Ireland Showcase Saturday! How It’s New York: Music From Ireland Showcase features a selected Irish line-up from New York City’s CMJ Music Marathon 2012. 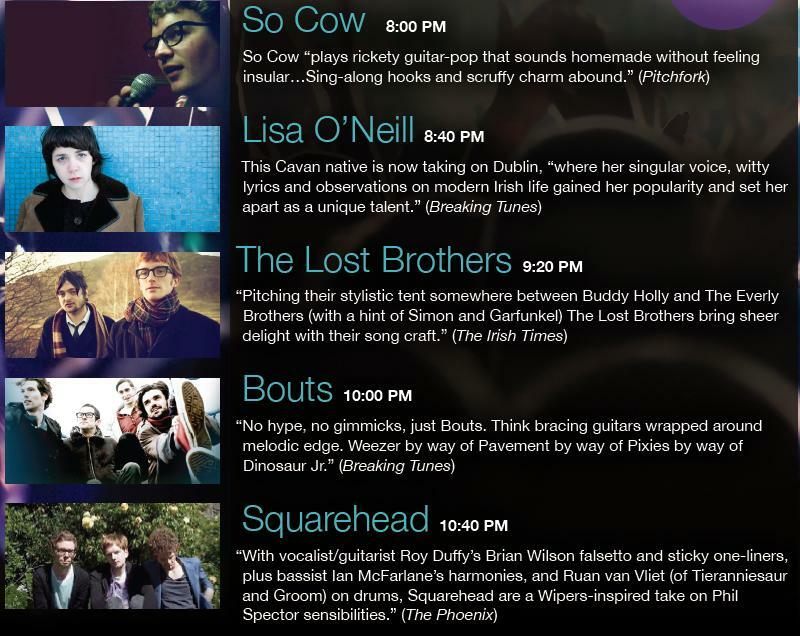 How It’s Irish: Music From Ireland Showcase is an intimate preview of the Irish bands and musicians performing at CMJ – including So Cow, Lisa O’Neill, The Lost Brothers, Bouts and Squarehead. Artists, music fans, and industry insiders descend on New York City every fall for the annual CMJ Music Marathon. The festival is one of the world’s most important outlets for the discovery of new music, with more than 1,300 performers given a chance to shine in over 80 nightclubs and theaters spread across the city. Spearheaded by Music From Ireland, an initiative run by First Music Contact in partnership with Culture Ireland, Irish artists and bands are a prominent part of six major music festivals – including CMJ Music Marathon each year. Past Irish showcases have featured Fionn Regan, The Lost Brothers, Julie Feeney, Villagers and many more. Join us for an intimate preview of the showcase of Irish bands and musicians performing at CMJ. Join us for a members-only intimate preview of the Irish bands and musicians performing at CMJ. Presented by First Music Contact, the Music From Ireland Showcase is a perfect opportunity to spot emerging performers as well as a chance to see more established artists perform in full spirit.